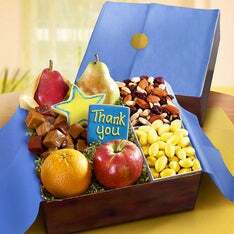 Autumn is a time for giving thanks for the fresh bounty of the season, but it’s also a time to acknowledge the loved ones who enrich our lives. 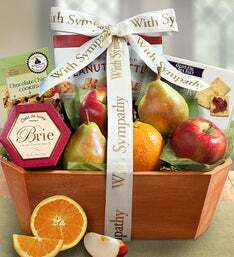 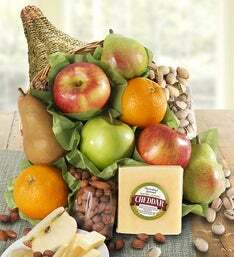 Express your appreciation with this autumn gift box packed with the ripe, rich flavors of fall, including juicy Comice and Bosc pears, crunchy hand-picked Fuji apples, decadent Ghirardelli® Chocolate Squares, nutty butter toffee pecans, a large pumpkin shaped iced sugar cookie and more. 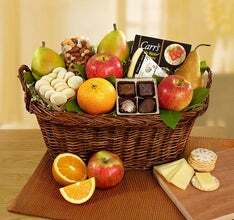 The Deluxe box also includes Caramel Corn, Sea Salt Caramels, more Ghirardelli Chocolate Squares and a Granny Smith Apple. 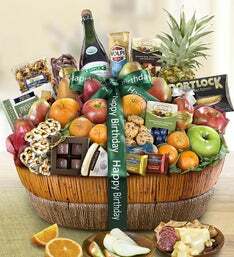 Deluxe Size Box Net wt 6 lbs.